I got nailmail!! And it's from my parents! How unexpected! Hahah. Alright, so maybe not so unexpected - my parents went on a cruise through Eastern Europe earlier this month and said they'd keep an eye out for nail polish to get for me. And their package just came for me today! It woke me up actually, and I didn't have pants on when the delivery man got here so I had to scramble (story of my life - pants are overrated). So what did I get? 3 Miss Selene mini bottles from Serbia, and a bottle of Bourjois Paris microbeads from Hungary. I've never used either of these brands, so I decided to swatch some of the Miss Selene colours for Swatch-It Sunday this week. :) Overall, I'm pretty pleased with them. Review time! 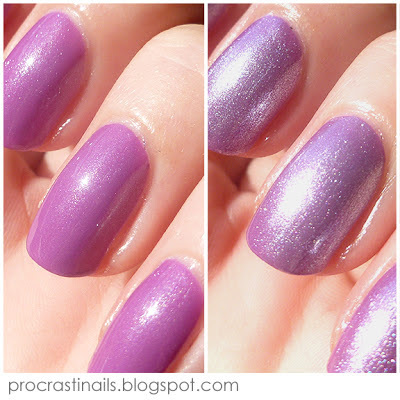 (Note: Neither of these colours seemed to come with names, so I'm identifying them by their numbers (following what I've seen other bloggers do with this brand). 225 is a surprisingly rich violet with just a hint of shimmer in it. In the bottle it looks pearlescent, but it doesn't come out that way. 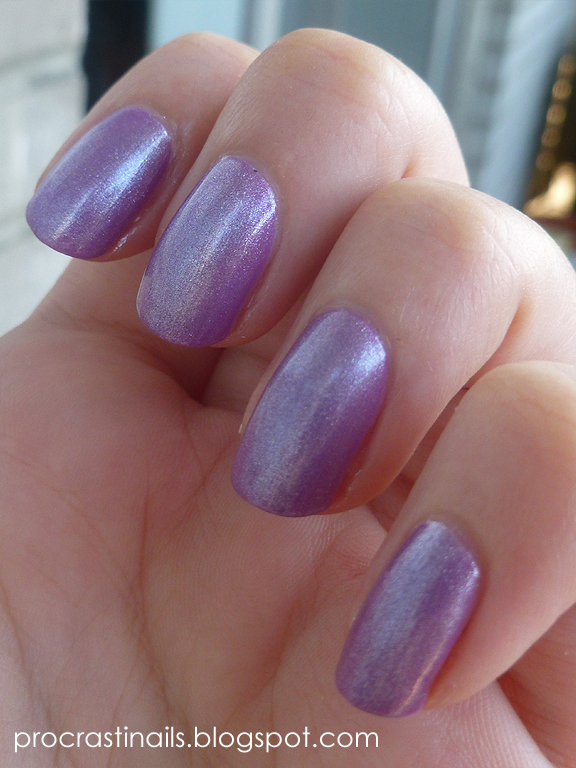 It's also way less sheer than I expected; two coats and this is pretty much opaque! I used three for these pics, but it wasn't needed. 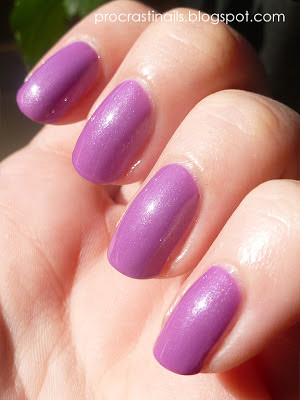 148 is super sheer, and I imagine would take about 4-5 coats to get full coverage on its own. 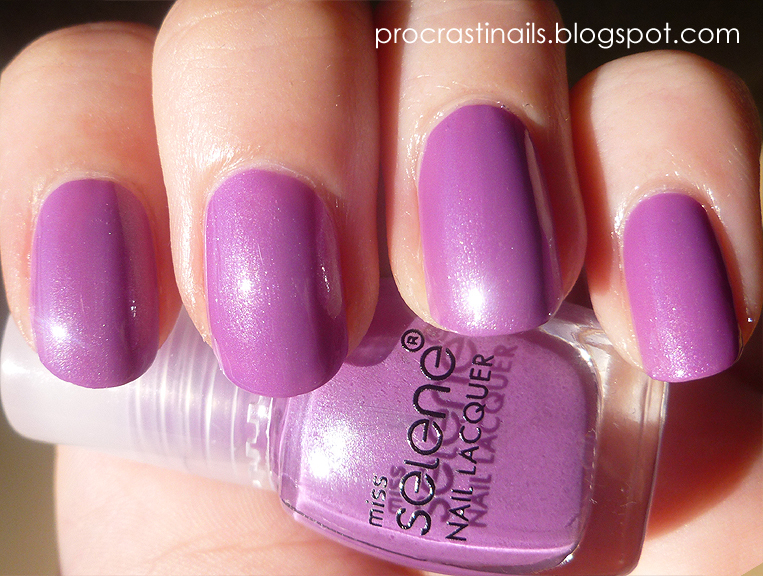 I think it's best saved for using as a topcoat (like I did here) which it did beautifully. It's a frosty silver with just a hint of purple, and just like 225 there's some shimmer that comes through on the nails that you can't pick up when it's in the bottle. Here they are! 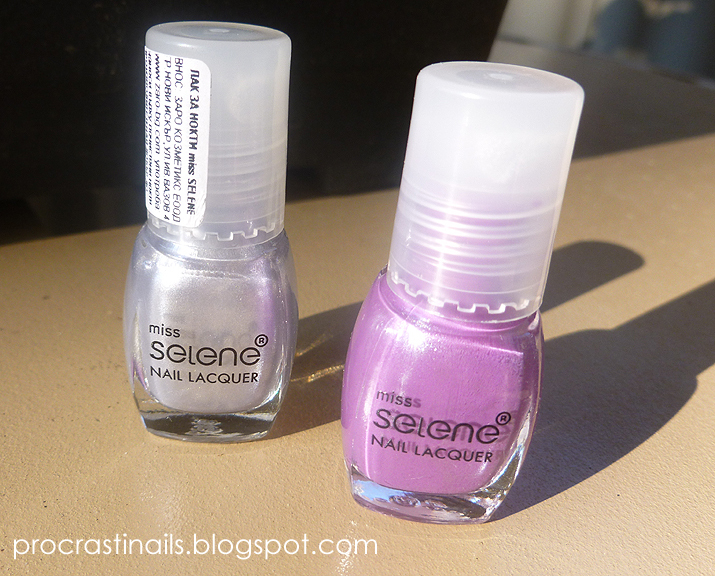 (L to R) Miss Selene Nail Lacquer in 148 and 225. 148 went on really well! Even though I had to run the brush over my nail in three different strokes for full coverage, the whole thing settled without any visible brush lines. I should also mention that 148 was put on without a topcoat. Lovely!